If Michigan is ever to effectively manage public employee benefit costs, it must first engineer these plans around the taxpayers’ ability to pay both now and in the future. This means having costs that are current, predictable and affordable. The research for this paper revealed little evidence of all three parameters in MPSERS and MSERS pensions and retiree medical benefits. Moreover, the future portends greater fiscal challenges. Given the precarious fiscal state of affairs in Michigan, one is reminded of the frequent experience that when taxes are increased, economic activity contracts. As evidenced in the tax increases associated with the prior state budgets, tax increases to address MPSERS and MSERS would undoubtedly have a corresponding impact in the marketplace. Expected future increases in employee benefit costs will further test the system and lead to a difficult economic environment. This situation is particularly ironic, given that the state was visionary in converting to a defined-contribution plan for MSERS members in 1997. This is a case study for the state. Such a conversion reaffirms the notion seen in the private and public sectors that annual pension costs need to be in the range of 5 percent to 7 percent of payroll. Despite the MSERS Tier 2 defined-contribution plan, which carries no unfunded liabilities, MSERS on the whole continues to carry an unfunded deficit from Tier 1 participants who were members of MSERS prior to 1997. This liability is scheduled to be paid off over the next 27 years. Michigan policymakers should mirror the 1997 action and place all new public school employees in a defined-contribution plan to achieve affordable, predictable and fully funded costs. The state should also begin to better manage its GASB 45 OPEB liability through a combination of plan design and eligibility reforms. Public understanding of MPSERS and MSERS pension and retiree medical benefits would be significantly enhanced if the Legislature required the Office of Retirement Services annually to publish a 20-year forecast of expected liabilities and expected taxpayer contributions. Such a projection provided now would affirm the belief that these programs are unsustainable and highlight the limited impact current reforms are likely to play in the long run. 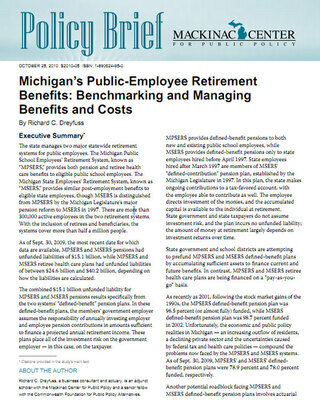 The idea of switching new MPSERS employees into a program similar to that of MSERS Tier 2 was recently analyzed in a publication of the Michigan Senate Fiscal Agency. The paper confirmed that in the long term, a defined-contribution plan for new employees would save money and provide predictable costs, but also concluded that the savings would not be realized for a number of years. The savings, however, would probably be even greater than estimated by the SFA. The paper implies that the normal cost of the MPSERS program represents the actual annual cost of the program. In fact, the normal cost of the program is only part of the annual cost; another portion is the annual payment on the unfunded liability. Hence, the normal cost does not represent the full cost of the plan. Indeed, if the normal cost were considered an absolute measure of the true cost of the MPSERS defined-benefit pension plan, the plan would not have an accrued unfunded liability of nearly $12 billion. Following this, all pension and retiree costs should be fully recognized during the working career of the workforce; in other words, amortization of an employee’s costs should not extend into the worker’s retirement years. The compound impact of these existing pension and retiree medical programs will likely create unaffordable costs. The only mitigating factor could be in the pension area, where market gains in excess of the benchmark of 8 percent could help offset future cost increases. However, the reality is that the investment assumption will likely be lowered to less than 8 percent and amortization periods will likely be shortened due to economic realities and potential GASB reforms. [*] Equally important is the risk that any future MPSERS and MSERS funding progress and higher-than-expected asset growth could be an incentive for additional benefit enhancements to be enacted. Poor benchmarking is a problem plaguing the public sector. Frequently, a given benefit provision or financial approach is justified as being common practice in other public plans — plans that often have even larger funding deficits. As an example, pension cost-of-living adjustments are virtually nonexistent in the private sector while defined-benefit plans are in decline, yet the common justification for such benefits is to simply reference another state that has them. Instead, Michigan policymakers should design employee-benefit plans considering market trends and the best-demonstrated practices in both the private and public sectors in Michigan and the rest of the country. These basic problems of poor benchmarking, deferred costs, and the lack of predictability and affordability in retiree costs will continue as long as they are ignored. These issues are highly interrelated. Without significant reforms, state taxpayers are facing costs that will exceed their ability to pay and will likely become significant burdens to the next generations of taxpayers. It is hoped this paper will provide a basis to promote an increased awareness and discussion on these needed reforms. [*] For instance, the Governmental Accounting Standards Board is currently considering a new standard that would require public-sector pension funds to amortize debt over fewer years and to assume a lower rate of annual asset growth for accounting purposes. See, for example, Dunstan McNichol, “States Face Pension Stress as GASB Rules Widen Gap” (Bloomberg Businessweek, July 9 2010), http://www.businessweek.com/news/2010-07-09/states-face-pension-stress-as-gasb-rules-widen-gap.html (accessed Sept. 6, 2010); “Pension Accounting and Financial Reporting by Employers: Plain Language Supplement,” (Governmental Accounting Standards Board, 2010), http://www.gasb.org/cs/ContentServer?c=Document_C&pagename=GASB/ Document_C/GASBDocumentPage&cid=1176156938146 (accessed Sept. 8, 2010).